SEATTLE -- Not long ago, dispirited by national politics mired in mean and a hopeless hometown baseball team, I sought a long day's refuge in the natural world. But it was not a frozen flank of Mount Rainier or an island in the inland sea that gave me the break I was looking for. It was an overcrowded perch in the heart of a metro area of nearly three million people. The return of the wild -- oysters in the Bronx River, healthy urban fish, a pure strain of bison newly introduced to Indian country in Montana -- is one of the narratives of hope in the dark days of a country held hostage by Senator Ted Cruz and his party of nihilists. All month, salmon have been coursing through my city. Fat cohos, athletic pinks, late-season sockeyes, even a chinook or two -- these fish are driven by a biological imperative to swim in from the ocean for a final fling in fresh water. 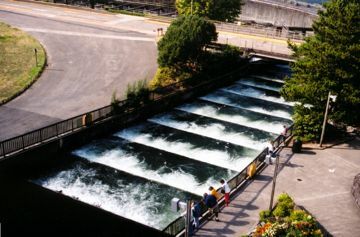 It doesn't matter how many skyscrapers, stadiums or highways they have to pass to get to the pools of their birth, salmon in the fall have a single purpose: spawn and die. This year, there are millions of them. Chinook, the mighty kings, are returning to the Columbia River in numbers not seen in decades. The run of pink salmon in Puget Sound and surrounding waters is pegged at six million or so. For this miracle of restoration, we owe decades of vigilance, patience and investment in tomorrow -- precisely the things lacking in the other Washington. As Teddy Roosevelt sought to preserve big, wild animals in order to get a chance to kill them, I've always wanted to save the salmon so I can eat them, in season, on a whim, after grilling them, rubbed with olive oil. At the outdoor store, I waded through aisles of camouflaged accessories and vials of urine taken from elk in heat (a "sexual attractant" used by hunters). In the fishing compound, I found my pink salmon lures and a bought a razor-sharp knife. Pink salmon return every other year. They are feisty, despite being the smallest of the five Pacific salmon species. They are not as tasty as other salmon, unless you bleed them immediately and cook them the same day. At dawn, I made my way through traffic, oblivious to the backups, the snarls, the caffeinated stares of commuters. Is there a better feeling in the world than going fishing when everyone else is going to work? I found a little bridge over the Duwamish Waterway, a point where an industrial part of Puget Sound meets a hard-working river. Upstream are airplane factories, cement plants, countless rusted hulks and, eventually, some cold clean water for salmon. The bridge was jammed, combat fishing. Peaceful it was not, hard by the growls of a city moving through its labors. This estuary was once a fishing ground for Chief Seattle's people, the Duwamish, who had a saying known to other natives: when the tide is out, the table is set. For much of the 20th century, the table was overwhelmed by industrial pollutants. It's cleaner now, though you'd never want to eat anything that fed off the bottom. Salmon merely pass through and stop eating once they hit fresh water. From the bridge, I elbowed my way to position. The surface of the water was alive with leapers, jumping as they moved into the Duwamish. People were pulling in pinks right and left. I made a dozen or more casts until I got the tug I was looking for. I let out a shout, pulled and reeled. Below, I saw my fish -- a real beauty. But just a few feet from the bridge, I lost him. Down below was a rock perch, still crowded, but closer to the water. I found a spot. Next to me, little kids were pulling in pinks. Shouldn't you be in school? Old women were landing them. I went fishless for an hour. How long would this ritual be a regular joy of autumn? At our end, we need clean water. But the open ocean, where salmon spend most of their lives, is something no one city, no one nation can control. The seas are absorbing 20 trillion pounds of CO2 a year, touching almost every part of the marine food chain, The Seattle Times reported in an exhaustive series on the "Pacific's perilous turn." The acidic waters are killing oysters and mussels and could imperil the pollock used by McDonald's in fish sticks. Sea butterflies, the tiny shelled creatures that make up nearly half the diet of pink salmon, are vulnerable. It doesn't take much for carbon from a coal plant in China to make its presence felt by a fisherman in Seattle. At last, I got a sure hit, and played the fish for nearly five minutes. Just as the salmon was in sight, a few feet from the rock shore, the fish shook off. My lure then caught a rock and broke. I took out my new knife and cut some line. I wasn't paying attention, my mind on the fish that got away, when I sliced through my finger. It was a clean cut, but deep. The knife I'd bought to bleed salmon was effective only in bleeding me. Blood gushed out. For a few minutes, I felt like the Julia Child parody on "Saturday Night Live," after the chef opens a big wound while cutting up chicken. I had to hold the cut to keep it closed. That was it for me. As the tide rose, I stood on the shrinking base of the rock, clutching a bloody finger as salmon jumped all around me, sunlight gleaming off the city, a ferry horn blaring in the distance. I was fishless in Seattle, and not unhappy.